Bhagavad Gita Art Gallery--Plate 30: "Know that all these beautiful, glorious and mighty creations spring from but a spark of My splendor.". "Know that all these beautiful, glorious and mighty creations spring from but a spark of My splendor." PREVIOUS Bhagavad-gita 10.41 A sampling of Krsna's infinite manifestations, both in the spiritual and material worlds. Outer circle (clockwise beginning from the upper left-hand corner): Indra carrying the thundrebolt, the Himalayas, Lord Siva with the Ganges River in his hair, the moon, the horse Ucchaihsrava, the transcendental om, Kapila, Rama, flower-bearing Spring, Kamadhuk, Arjuna, Vyasadeva, Prahlada, the shark, Vasuki, Skanda, Varuna, Yamaraja, the lion, Kuvera, Agni and Airavata. 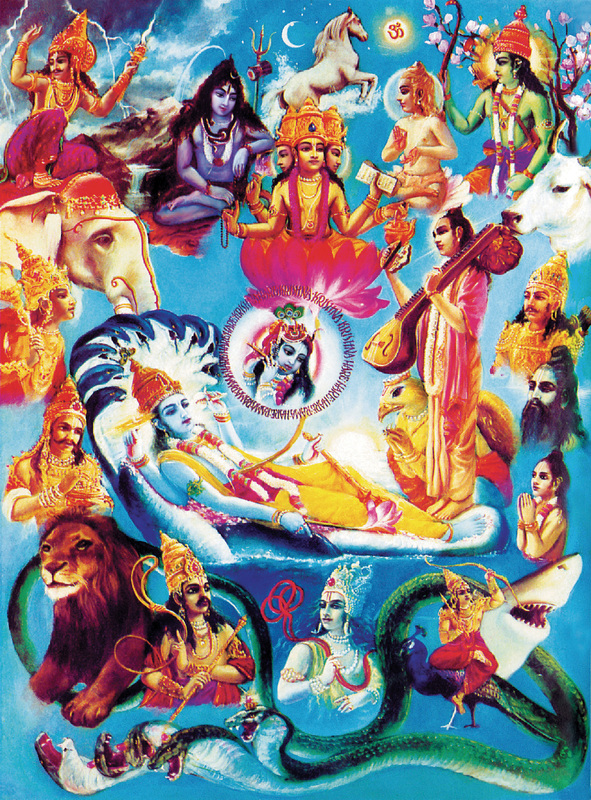 Inner circle, clockwise (beginning from four-headed Lord Brahma sitting on the lotus flower): Brahma, Narada, Garuda, the sun, the ocean, Lord Visnu, Ananta, and the chanting of the holy names-Hare Krsna, Hare Krsna, Krsna Krsna, Hare Hare/ Hare Rama, Hare Rama, Rama Rama, Hare Hare.